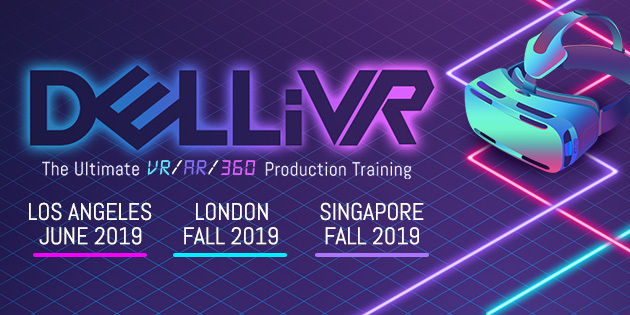 Join Boris FX presenters at the DELLiVR Conferences in Los Angeles and London to learn how Mocha Pro and the Continuum VR Unit help speed up 360/VR post-production tasks including object removal, stabilization, fixing flicker, adding blurs, and more. Join Boris FX team members, Brian Fox, Peter McAuley, and Mary Poplin, as they show you 2019 product highlights from the show as well as a sneak peek at the new creative effects and tools you’ll find in the upcoming 2019.5 releases for Sapphire, Continuum, and Mocha Pro. 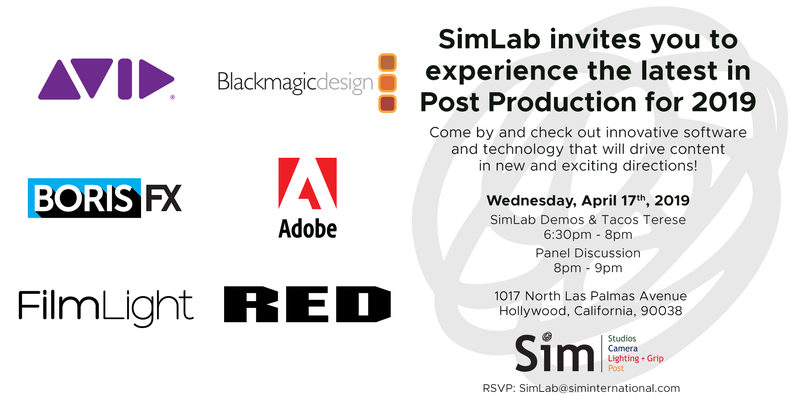 Join Mary Poplin, Senior Product Specialist, for a fun-filled night of post at SimLab in Hollywood, California. Mary will be showing the newest 2019 tools in Sapphire, Continuum, and Mocha Pro. 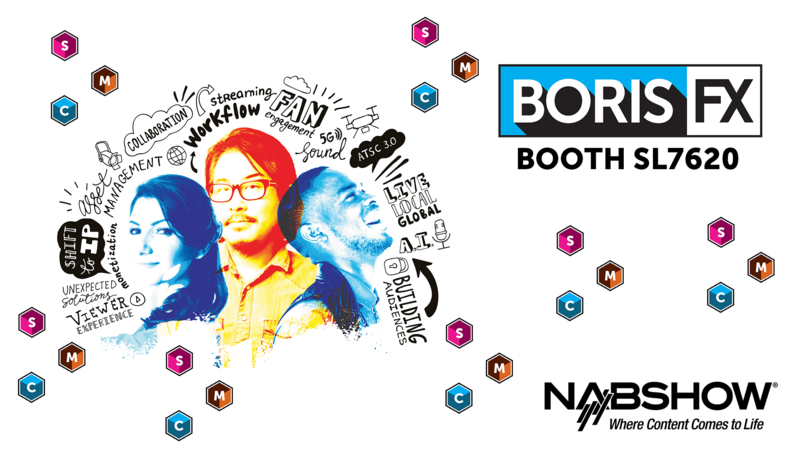 Join the Boris FX team at NAB 2019 in Las Vegas, April 6-11, 2019. See special guest presenters demo Sapphire, Continuum, and Mocha Pro in Booth SL7620. Plus giveaways and more. Special guest presenter and veteran colorist, Dan Harvey, gives Resolve colorists an introductory look at the new Particle Illusion motion graphics generator and shows why colorists will want to use it. We always love presenting in our hometown! 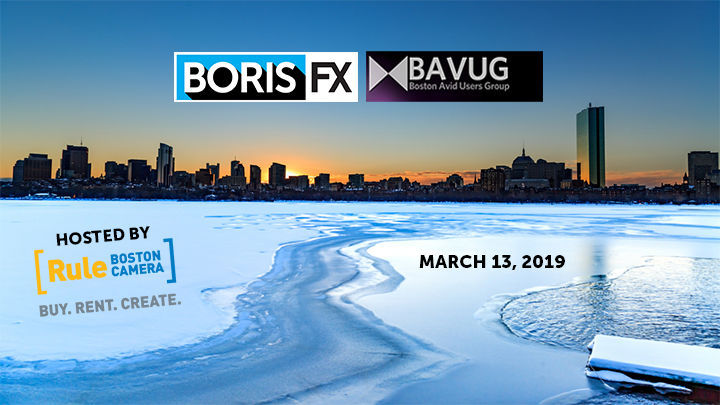 Join the Boris FX team at the Boston Avid Users Group (BAVUG) March 13th meet-up for a night of 2019 demos, food & drinks, raffles, and fun. 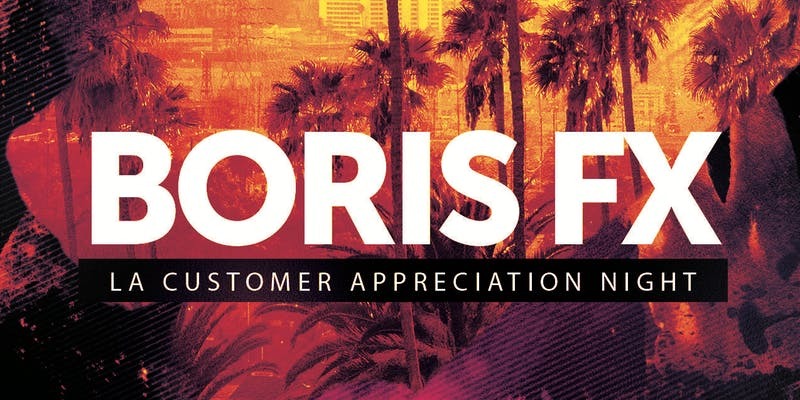 Join the Boris FX team in LA on Feb 27, 2019, for a fun-filled night celebrating you - our customers. Good food, good drinks, and good fun. Plus see what’s new in Sapphire, Continuum & Mocha Pro, raffles, and more! Join Mary Poplin at the LAPPG in Los Angeles, on February 13, 2019. She’ll be demoing the latest features of Sapphire 2019 and Continuum 2019. See what’s new, including Particle Illusion! 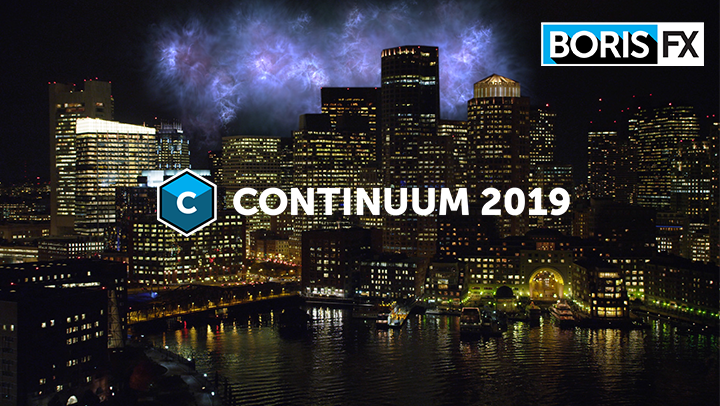 Join Boris FX’s Alan Lorence and Peter McAuley for an inside look at Continuum 2019’s powerful new Particle Illusion. Discover how the completely redesigned motion graphics generator (formerly particleIllusion) allows you to quickly add stunning, real-time motion graphics to any project. Relevant to all editors, compositors & motion graphics artists. Join special guest presenter, Tal, a veteran reality TV online editor and colorist, as he shows Avid editors the new features and tools you’ll be using most inside Continuum 2019. 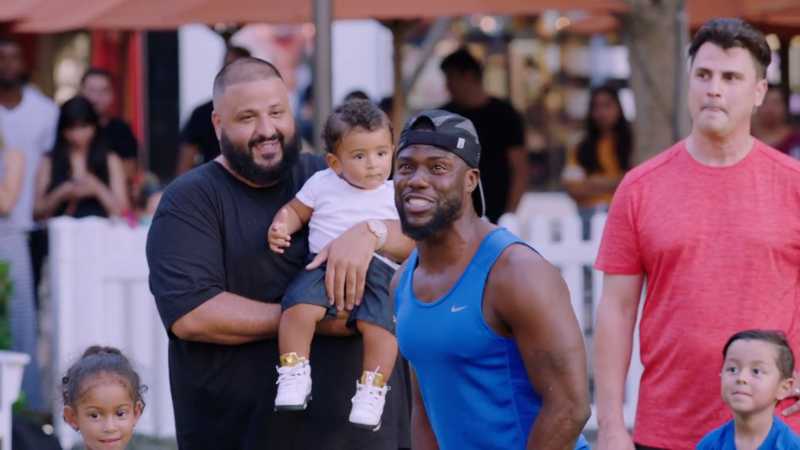 Tal will be sharing finishing techniques & tips using project footage from the YouTube Original series Kevin Hart: What the Fit for the LOL Network. Thursday, January 24, 2019 at 2pm EST/11am PST. 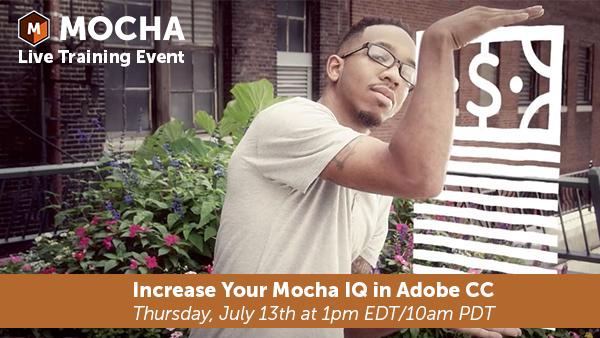 Live Training Event: How Mocha Pro and Continuum plug-ins can be used to quickly fix, remove, and clean-up footage inside Premiere Pro. A must-see for all editors. RSVP for December 13, 2018 at 2pm EST/11am PST. Live Training: What’s new in Continuum 2019. 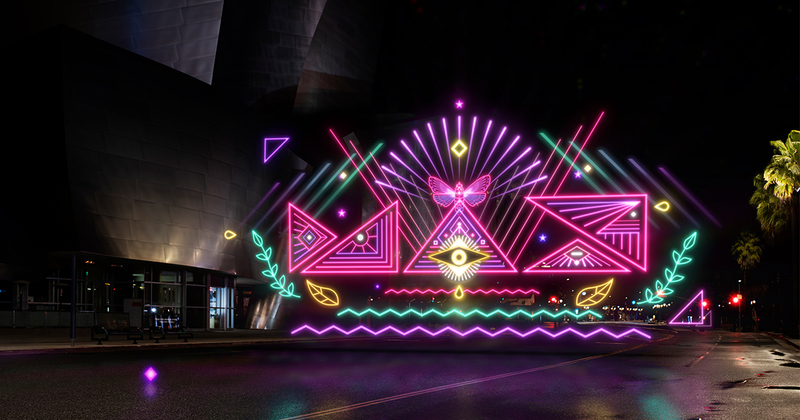 Highlights: The return of Particle Illusion high-end particle and motion graphics generator, new image-processing shaders inside Title Studio, new Mocha Essentials workspace, point-parameter driven tracking, and spline tools. RSVP for Friday, November 16, 2018 at 2 pm ET/11 am PT. 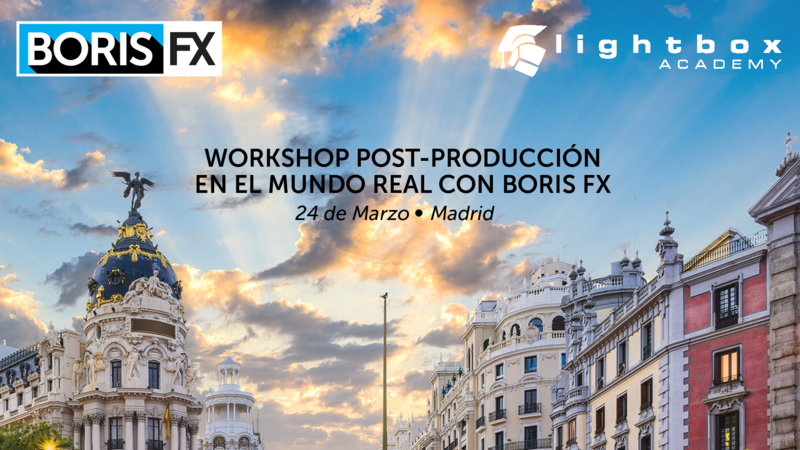 Join the Boris FX team at XTFX in London to see Mocha Pro 2019, the brand new version of the Academy Award-winning tracking, roto & VFX plug-in from Boris FX. Live Training: See what’s new in Sapphire 2019. Highlights: Completely redesigned lens flare tool, new effects like PixelSort & WhipLash, new hand-drawn transitions and vector wipe presets, and new Mocha masking tools. RSVP for Friday, November 2, 2018 at 2 pm ET/11 am PT. Join the Boris FX team at NYVR in New York (October 25-27) to see award-winning 360/VR plug-ins, Mocha VR and the Continuum VR, in action. Discover how you’ll streamline everyday 360 editing and VFX tasks inside Adobe, Avid, and OFX hosts. Join the Boris FX team at Adobe MAX in Los Angeles, CA. See how the new 2019 product line - Mocha Pro 2019, Continuum 2019, Sapphire 2019 - deliver major and time-saving and creative benefits to After Effects and Premiere Pro workflows. Visit us at Booth #1125, Oct 15-17, 2018. 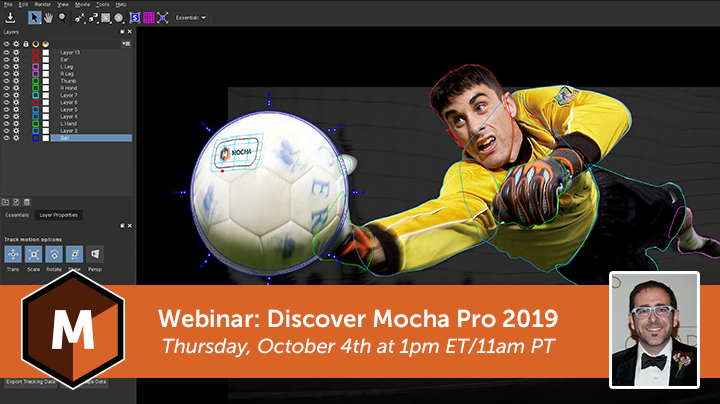 Live Training: Discover the new Mocha Pro 2019 planar tracking plug-in from Boris FX. $15K of VFX software prizes. RSVP Oct 4, 2018 at 1pm EDT/10am PDT. 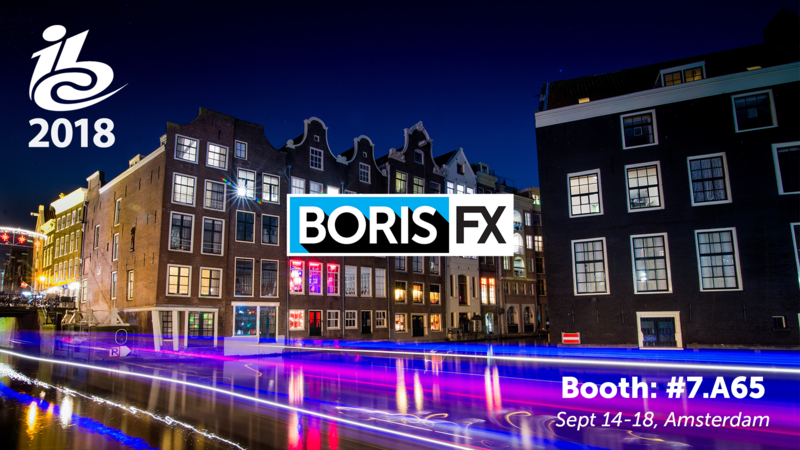 See Boris FX team in Amsterdam, Netherlands, for the European debut of new and upcoming releases of Continuum, Sapphire, and Mocha. 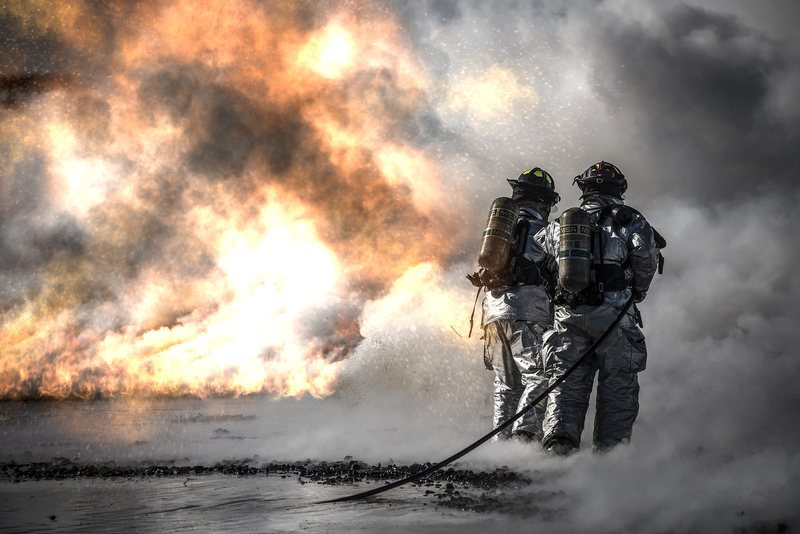 Find out why top broadcast editors and VFX artists turn to Boris FX’s award-winning VFX plug-ins. Demos, raffles, and more! September 14-18, 2018 in Booth 7.A65. 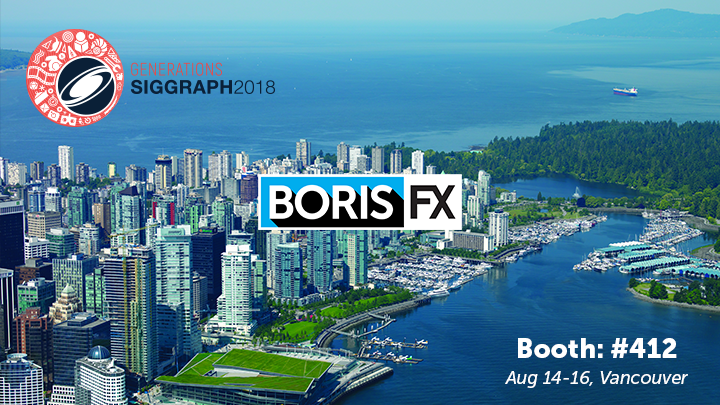 Meet the Boris FX team in Vancouver for SIGGRAPH 2018. 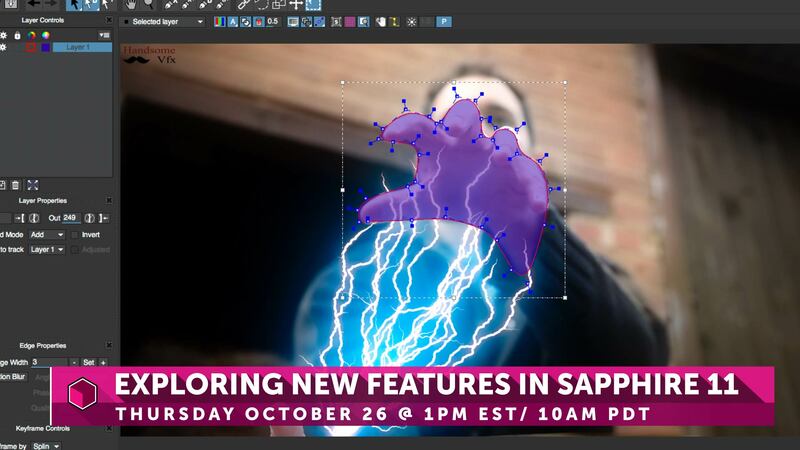 See sneak peeks of upcoming VFX and motion graphics tools, including Mocha Pro, Sapphire, and Continuum. Plus award-winning 360/VR tools and more. 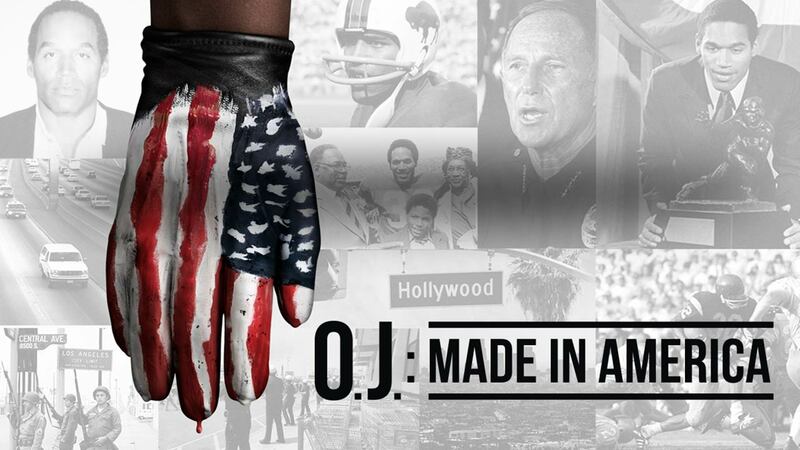 Join special guest presenter, Seth Buncher, veteran documentary editor and colorist whose work includes the Oscar-winning O.J. : Made in America, A&E’s The First 48, and MTV’s True Life, for a must-see live training event for everyone who works on documentaries or docuseries. See the Boris FX team at VRTO 2018 in Toronto, Canada. Discover how Mocha VR and Continuum VR help 360 content creators work faster in post & VFX inside popular host applications like Adobe, Avid, FCP X, and OFX. June 16-18, 2018. 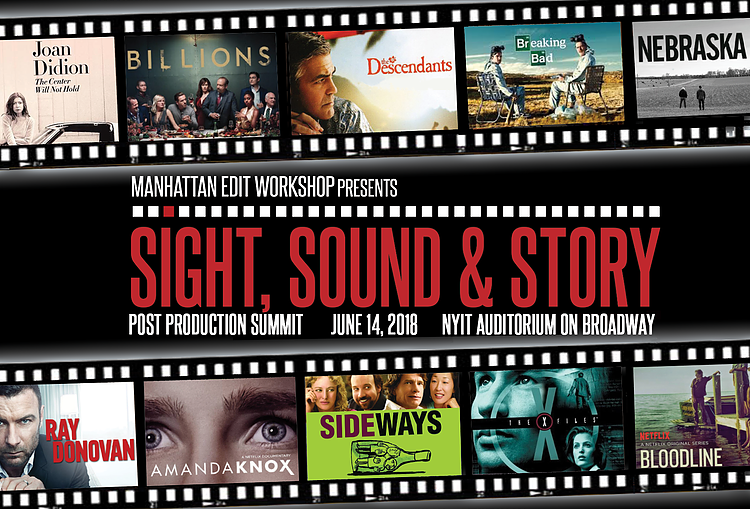 The Sight, Sound & Story: Post Production Summit, an event produced by the team at MEWShop, will be held on June 14, 2018 in NYC. Boris FX is excited to be an event sponsor, and will be giving away subscriptions to Mocha Pro to all attendees. 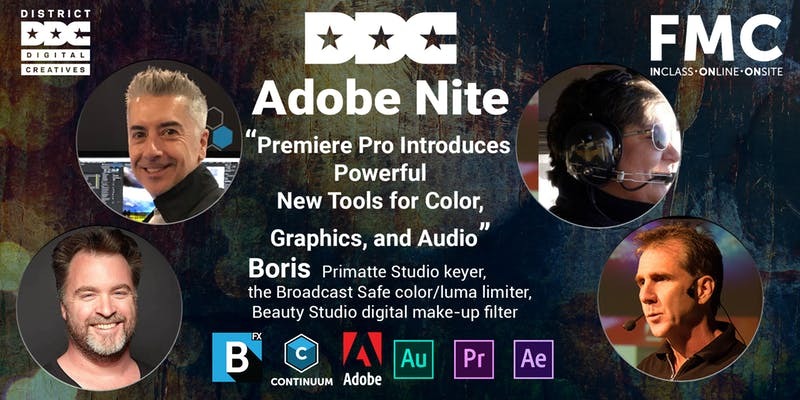 Join the Boris FX team at District Digital Creatives “Adobe Nite” in Washington D.C. on May 30, 2018. See how Continuum 11’s newest features add major VFX tools to Premiere Pro workflows. Join the Boris FX team at the How to Create VR Meet-up on Wednesday, May 23, 2018 in Fullerton, CA. See how Mocha VR and Continuum VR plug-ins help you easily remove objects from 360° projects and more. 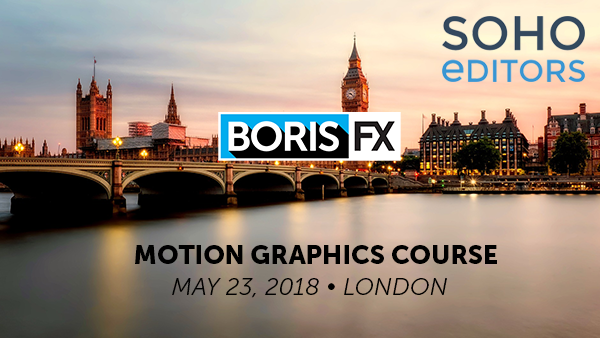 Boris FX has teamed up with London-based training facility, Soho Editors, for an introductory motion graphics course. Learn how Sapphire, Continuum, and Mocha Pro can be used together to create high-quality, professional motion graphics packages. A one-day training course. Ever asked to remove unwanted elements from a shot? Join Mary Poplin, Product Specialist, as she shows you how easy it is to remove wires, people, and more from a clip using Mocha Pro’s unique Remove Module powered by planar motion tracking inside Adobe After Effects. Working in 360 video? 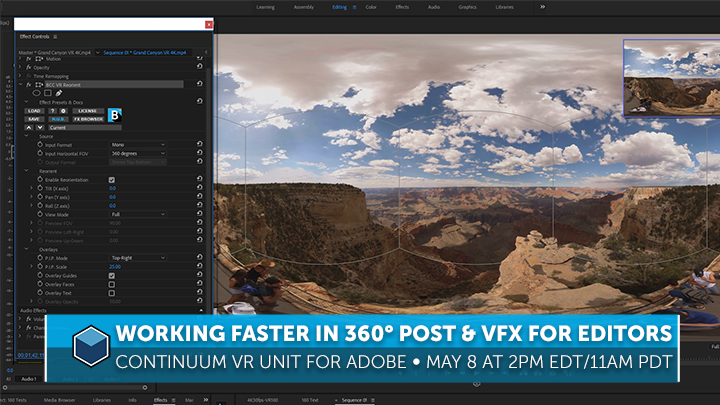 Learn how the Continuum VR Unit helps editors work quickly inside 360/VR projects with five filters to tackle common 360 post and VFX tasks. Hosted by Adobe-certified trainer Nick Harauz. 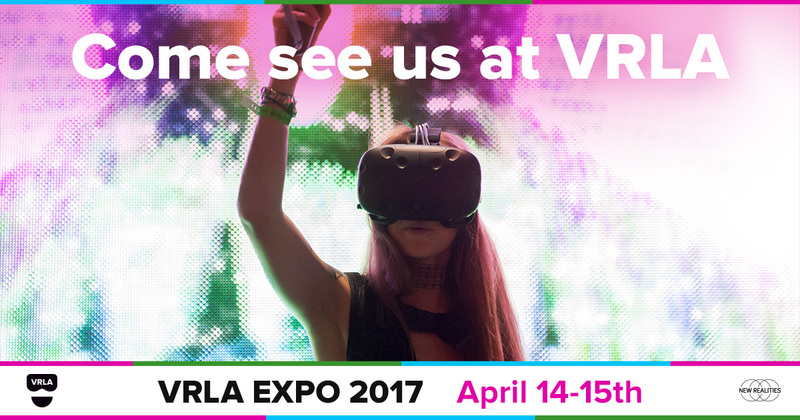 Join us at VRLA in Los Angeles, May 4-5, 2018. Swing by the Exhibit Hall to see Mocha VR, the multi-award-winning 360/VR tracking and masking toolset, and the new Continuum VR Unit, in action. Join us at The NYC Adobe After Effects Group Meet-up on May 1, 2018. Increase your VFX IQ with tips for bringing motion tracking and roto into your work. See how Mocha Pro, Sapphire, and Continuum can streamline your workflow and increase your creative productivity. 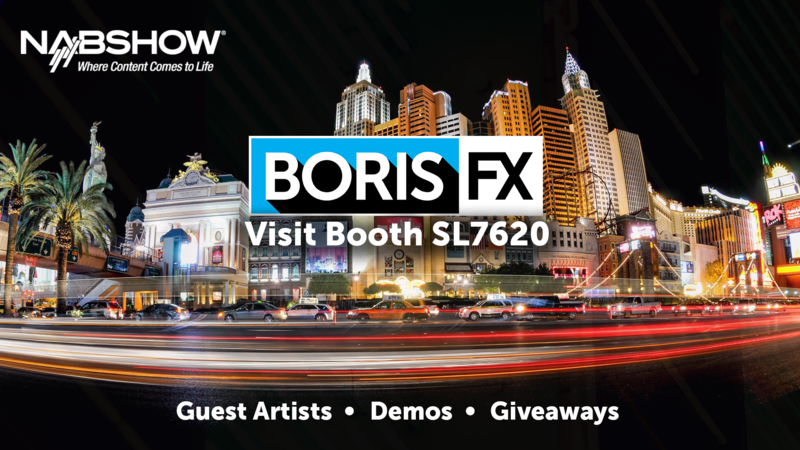 Join the Boris FX team at NAB in Las Vegas, April 9-12, 2018. Swing by Booth SL7620 to see the latest award-winning VFX and editing plug-in tools, and get a sneak peek of a few new ones! Featuring special guest artists, raffles, and more. Boris FX will be talking 360 post and VFX challenges. See demos of Mocha VR and Continuum VR. 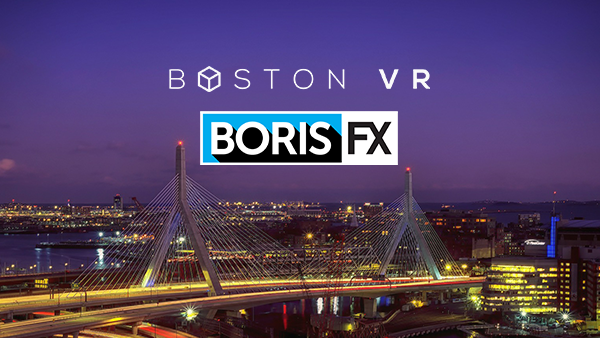 Join us at Boston VR on April 23, 2018. RSVP now. 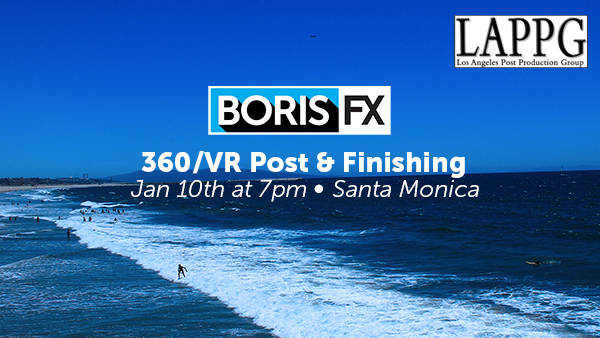 Join the Boris FX team for a night of 360 filmmaking in London, U.K. 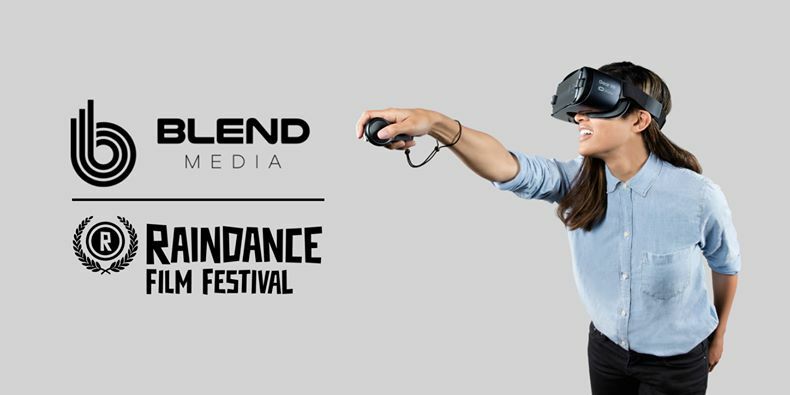 The 360 Filmmaking Masterclass with Blend Media is jam-packed with useful advice and tips on how to craft powerful 360 films and VR content. Jose Panadero, Adobe Certified Instructor y Director del Área de Motion Graphics en Lightbox Academy, mostrará cómo usar los productos de Boris FX en los entornos de post-producción real con un montón de ejemplos de motion graphics. 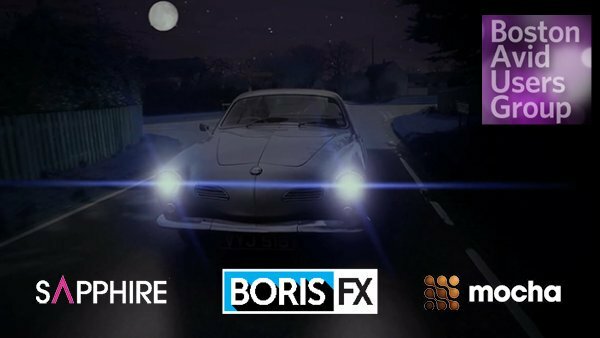 Join the Boris FX product team for a night showcasing top tips and tricks for Media Composer editors. Discover how the newest effects and features inside Sapphire and Continuum can be used to streamline your workflow. 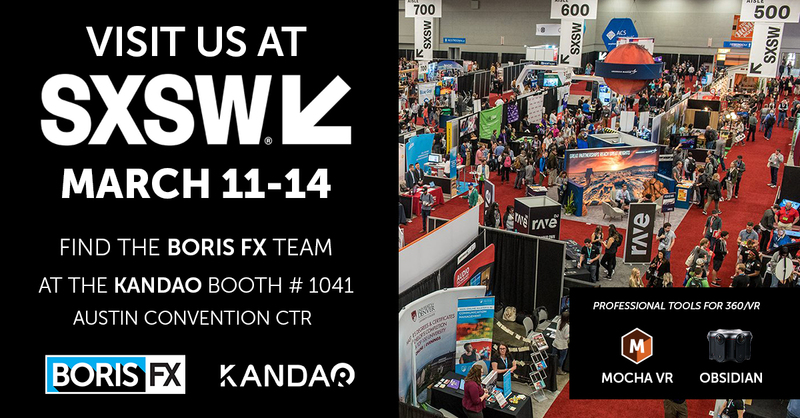 See the Boris FX team at SXSW in Austin. Ross Shain will be demoing Mocha VR for 360/VR post and VFX workflows in the Kandao Obsidian booth 1041, Mar 11-14, 2018. 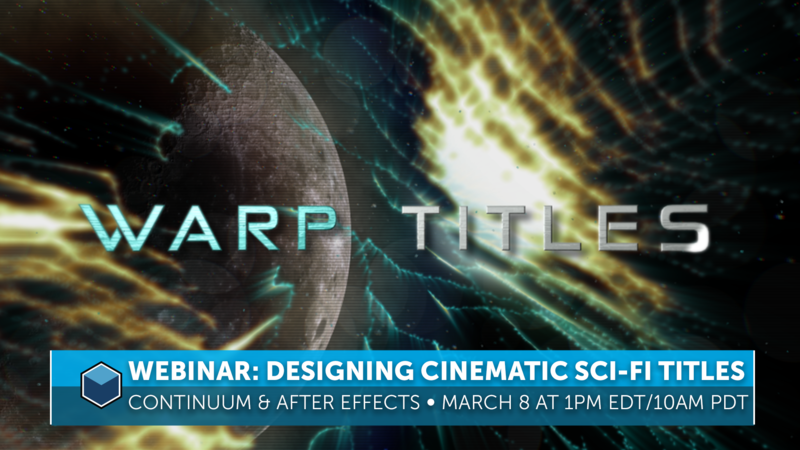 Learn how to create an advanced science fiction themed motion title sequence from scratch WITH Continuum inside Adobe After Effects. 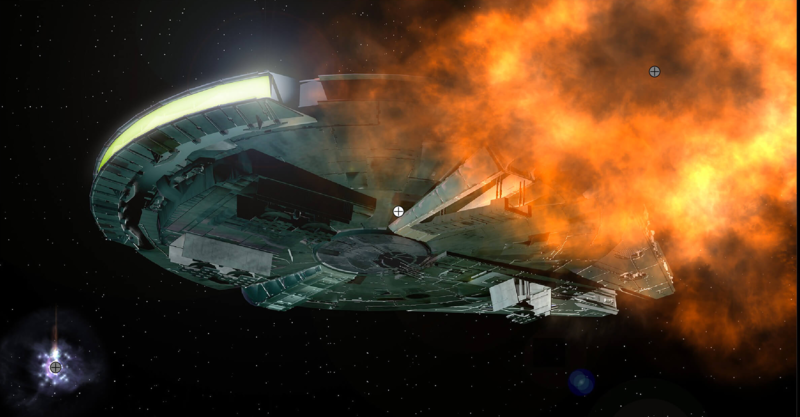 Our step-by-step breakdown will have you creating your own blockbuster titles. 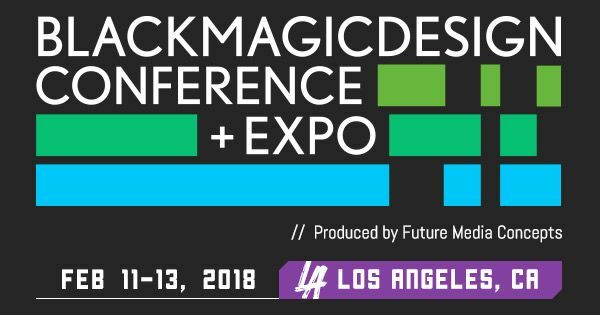 Join Boris FX at the Blackmagic Design Conference and Expo in Los Angeles on February 12, 2018. 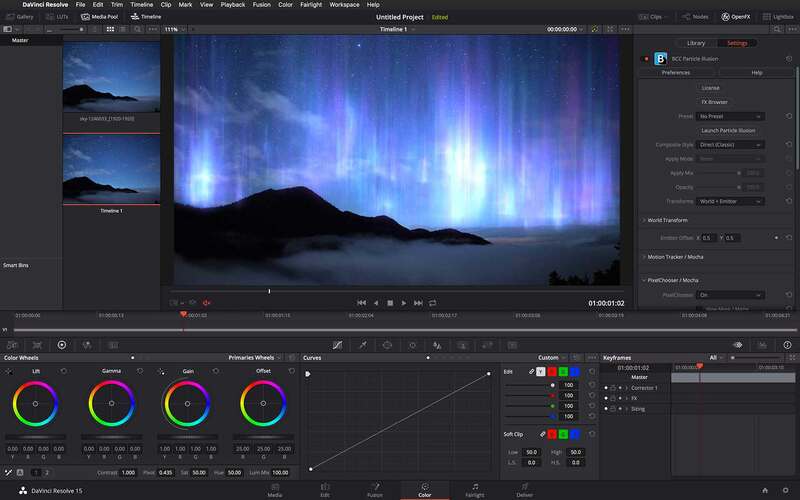 See the newest VFX & editing plug-ins for Resolve and Fusion. 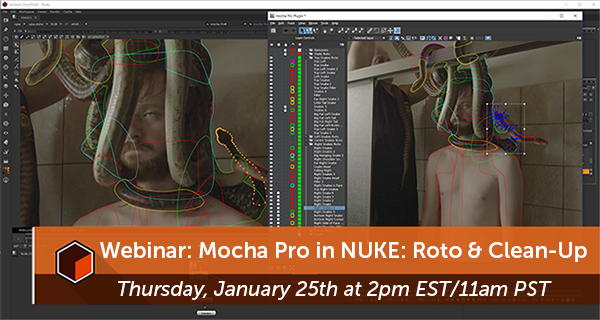 Hollywood VFX artist & roto/paint supervisor, Clark Harding, shows how to take your Mocha Pro + NUKE roto and clean-up skills to the next level. Top tips and advanced techniques. 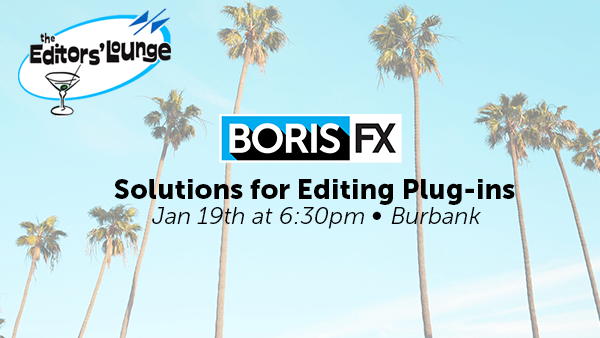 Join Boris FX for a fun night at Editors’ Lounge in Burbank, CA on January 19, 2018. See what’s new in Sapphire 11 (hint: Mocha integration) and Continuum 11 (hint: Academy Award-nominated keying tech) for Media Composer and Adobe editors. Plus, giveaways, food & more. The Los Angeles Post Production Group is holding its first event of 2018, and Boris FX is excited to be among the presenters. Come network, enter to win awesome giveaways, find out about Boris FX’s VR offerings, and get some tips on working in Hollywood. 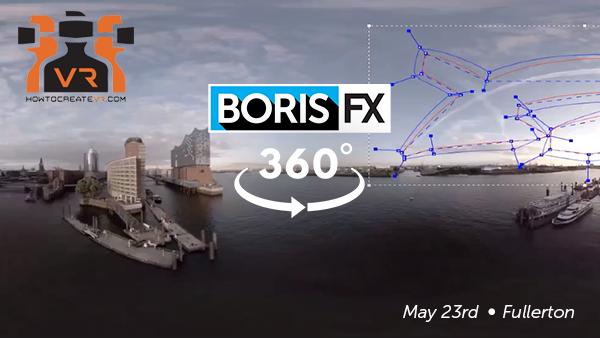 Boris FX announces new tools for professional 360/VR video post. Join VFX guru Ross Shain, for a live training event covering the five new 360° enabled filters included with Continuum 11 and Mocha VR’s upcoming stereoscopic support. 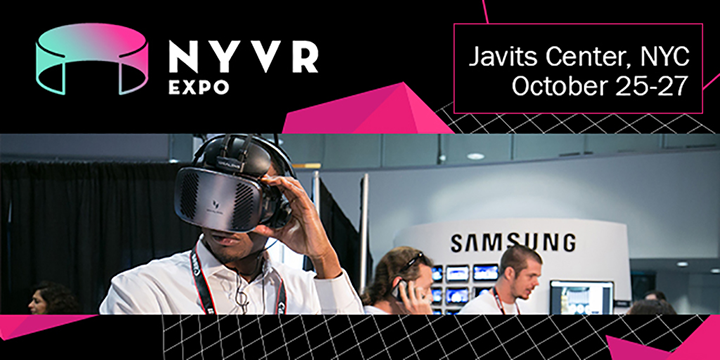 If you are interested in AR and VR, join Boris FX at the NYVR Expo from October 26-28, 2017 at the Javits Center in NYC. Join Adobe and Avid certified instructor Nick Harauz as he takes an introductory look at the new features in the just-released Sapphire version 11. Continuum 11 for Avid is almost here! Avid trainer Kevin P. McAuliffe gives Avid editors an inside look at what’s new in Continuum 11, including the next-gen green/blue screen keying and compositing tech: BCC Primatte Studio. 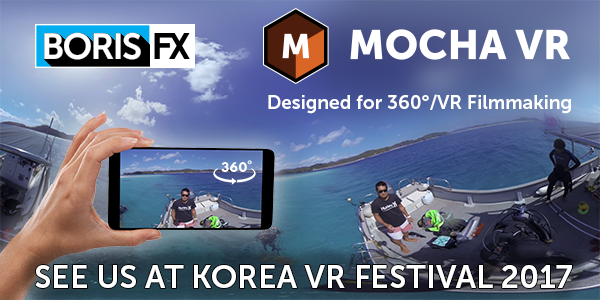 Find out more about Mocha VR at the Korea VR Festival taking place September 16 - 20, 2017. See demos of new products Continuum 11, Sapphire 11, and Mocha VR for Adobe, Avid, and OFX hosts at IBC, September 15-19, 2017 in Amsterdam. Plus meet the team behind your favorite VFX plug-ins. Adobe Video World 2017: See Boris FX’s award-winning products, Sapphire, Continuum, and Mocha inside Adobe After Effects and Premiere Pro. 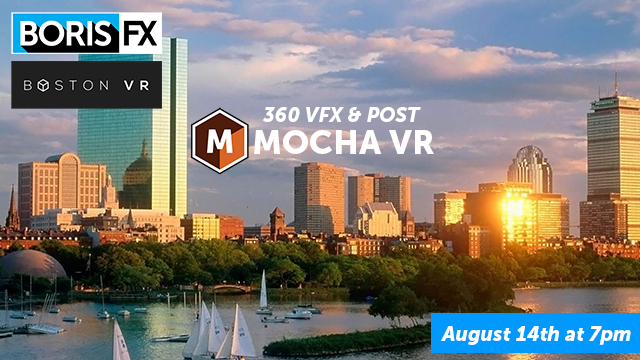 Join Mocha guru Ross Shain at Boston VR on Monday, August 14, 2017 for a night of 360/VR demos and networking. We hope to see you at SIGGRAPH 2017! We’ll be showing Mocha VR, a new 360/VR Unit, and a sneak peek at Sapphire 11. VRLO 8 - London, U.K.
Join members of the Boris FX team at VRLO 8 in London. 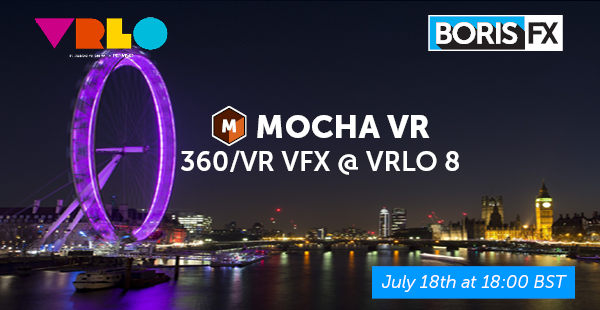 We’ll be showing a new version of the award-winning Mocha VR, including a new stereoscopic 360 workflow. Join Mocha Mentors, Ross Shain and Mary Poplin, as they show top Mocha tips & techniques for advanced VFX inside Adobe CC: Adobe After Effects & Adobe Premiere Pro. Get your questions answered live by the pros! Ross Shain, Chief Product Officer at Boris FX, will be speaking at the VRTO - Virtual & Augmented Reality World Conference & EXPO 2017, a one-of-a-kind symposium for experiential media and technologies. 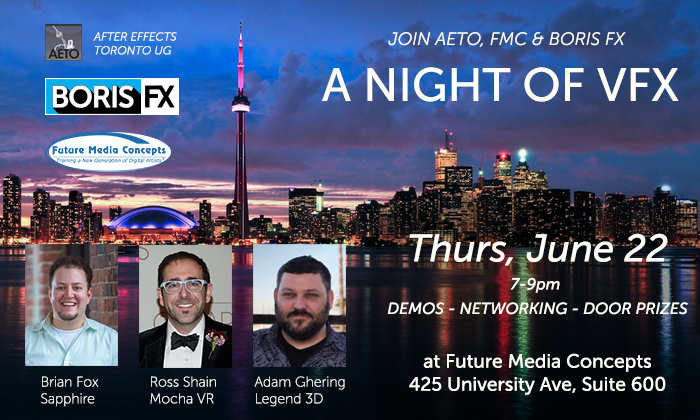 Join Boris FX for a night of VFX in Toronto. See Sapphire and Mocha VR in action inside Adobe After Effects. Co-sponsored by After Effects Toronto and FMC. Ross Shain of BorisFX will be moderating a Cinematic 360/VR Panel: 360 Degrees of Storytelling at Sight, Sound & Story, a speaker series that brings audiences “behind the scenes” with legends of visual storytelling. Join colorist and trainer Ben Brownlee of Curious Turtle as he shows off Sapphire plug-ins in the new Resolve Studio 14. 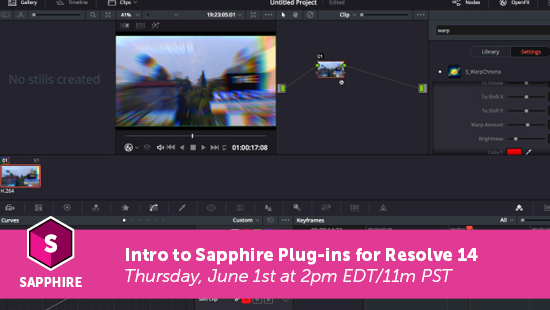 Ben will demonstrate how editors and colorists can use Sapphire plug-ins in Resolve 14. See Ross Shain of Boris FX and other speakers discuss VR at the NY Video Meetup in the NYC Vimeo office in May. Viva Las Vegas! Come visit us at NAB, April 24-27, Booth SL6824. 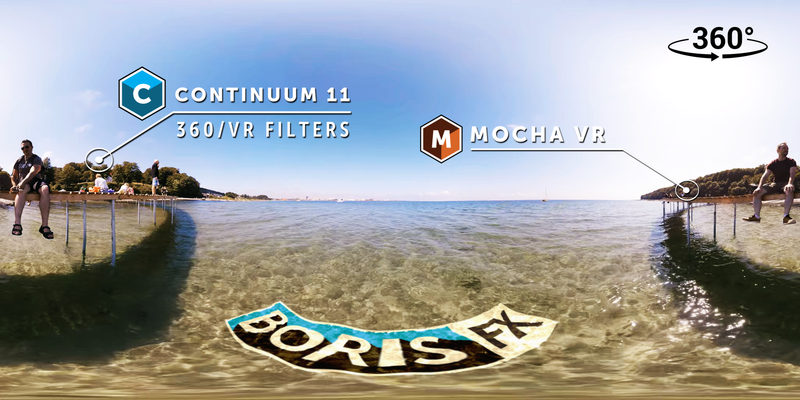 We’ll be previewing Continuum 11 and Sapphire 11, along with our recently released groundbreaking new plug-in Mocha VR. Plus giveaways & more! Learn more about our product plans. Guest Artists Special Presentation Chris Healer, CEO, themolecule.com “Invisible”: Demystifying the close relationship between VFX and VR Dates & Times: Monday-Wednesday at 1pm Chris Healer, CEO and Partner at The Molecule, has recently built a Virtual Reality department within a company that has built its foundation on Visual Effects and Animation. If you can’t make it to NAB next week, don’t miss out on this live training event! Editor Mae Manning, one of our special NAB guest demo artists, is giving a sneak peek at what she’ll be presenting the show. 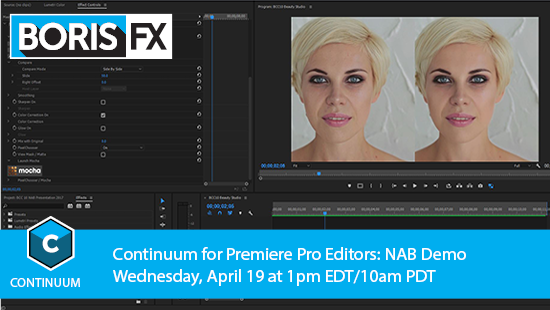 Join us for Continuum for Premiere Pro Editors. Swing by our booth at VRLA in Los Angeles to see our groundbreaking new 360 plug-in Mocha VR. Join us at SVVR in San Jose. 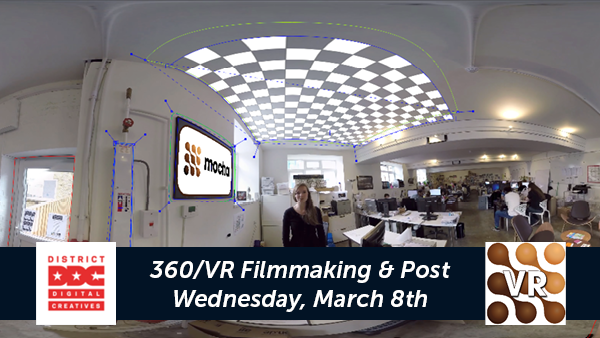 See Mocha VR in action and discover how it’ll revolutionize your 360 post & VFX workflows. 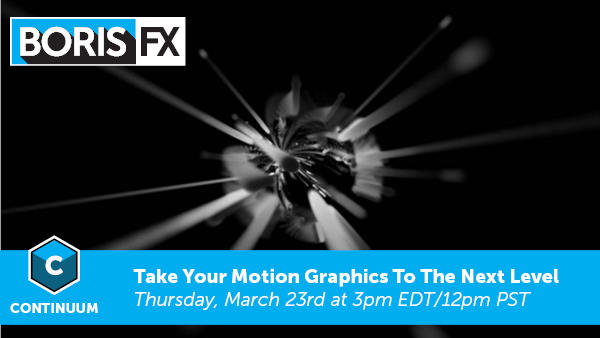 Join John Dickinson of Motionworks.net as he dives into one of the most exciting areas of Continuum - 3D particles! John will show you how to easily create your own stunning motion graphics using examples from his brand new Continuum Particle presets. Join Ross Shain of Imagineer Systems as we debut Mocha VR in LA for a night of all things 360/VR! Plus special guests Legend VR, Mettle Skybox & prizes. 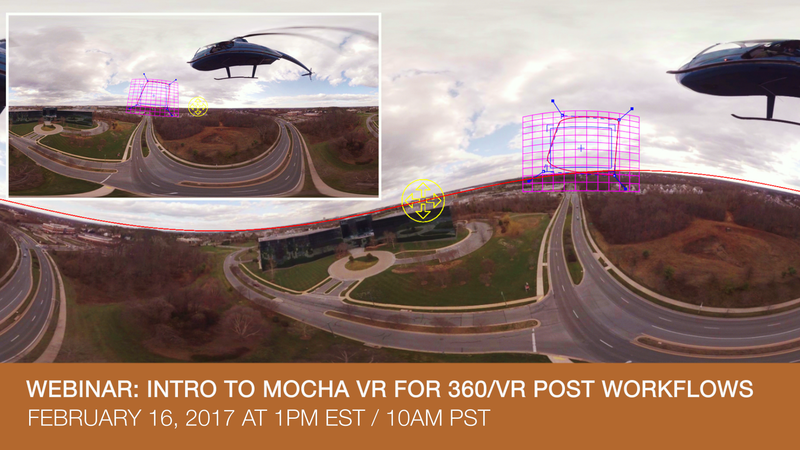 See the new Mocha VR plug-in & learn about 360/VR post at District Digital Creatives in Washington DC on March 8, 2017. New Yorkers, learn about Mocha VR, the brand new VFX plug-in that will change the way you work in 360/VR. Special guest speakers & more. If you work in 360/VR, you won’t want to miss this live training event! 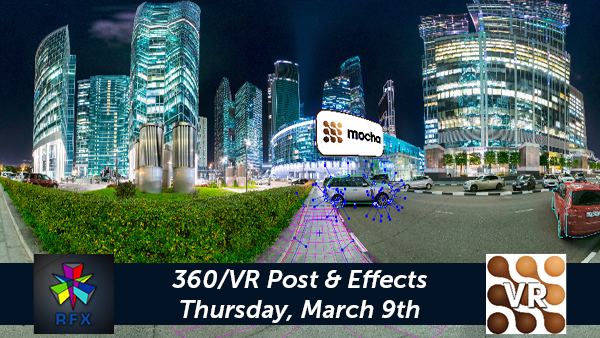 Join Mary Poplin, Imagineer Systems Product Specialist, as she introduces Mocha VR - a groundbreaking new 360/VR post-production toolkit from the Academy Award-winning developers of Mocha Pro planar tracking and masking software. January 2017 Webinar: Supercharge Your Sequence with Sapphire Builder! Join Brian Fox, Emmy Award winning editor and Director of Product Marketing for GenArts, as he teaches Avid Media Composer editors how to use the revolutionary Sapphire Builder to create vibrant and complex video treatments without ever leaving the Avid timeline. Martin Zwanzger, ein erfahrener Spezialist für Titeldesign und Animation in Spielfilmen, zeigt in diesem deutschen Webinar, wie man mit Continuum Complete und Adobe After Effects professionelle 3D-Titel erstellt. Als Grundlage dienen Beispiele aus seiner neuen Vorlagensammlung Blockbuster 3D Titles, Volume 2. Join us for the last BAVUG meeting of the year! Following the recent acquisition of GenArts, we’ll be showing how BCC 10 + Sapphire 10 (newly released) + mocha Pro 5 inside Avid Media Composer offer serious time-saving tools and infinite creative options. Join us in London for VRLO 6! Speakers include Imagineer Systems CEO J-P Smith, who will be previewing mocha VR - a new 360/VR tracking tool. Date: Wednesday, November 23, 2016 Time: Doors open to VIP's at 4pm, and the public from 6pm Place: Amba Hotels Marble Arch (Bryanston St, London W1H 7EH, London) Learn more. Transitions can seamlessly blend cuts together or instantly set the style of your project. Join Adobe certified trainer Nick Harauz as he teaches Premiere Pro editors how to take transitions to the next level with the new Sapphire 10 Transition Builder. Presented jointly by Boris FX, Imagineer Systems, and GenArts Date & Time: Thursday, November 17, 2016 at 12pm EDT / 9am PDT Space is limited. Register today! Topics covered: Learn the ins and outs of how to use the Sapphire Transition Builder to create custom transitions right inside Premiere Modify your favorite classic Sapphire transitions within Builder for a new and fresh look Explore the pre-built advanced transitions that ship free with Sapphire v10 Walk through the cross platform capabilities of the Transition Builder to share preset transitions between Avid, Premiere and Resolve. Join us at the Mass Media Expo (New England’s Largest Media Conversation). We’ll be demoing all three products in the Boris FX family - Continuum Complete, and Sapphire, and mocha. Meet product managers and demo artists, see what’s new in the latest versions of the products, and find out how all three products can be used to complement your workflows, saving you massive-time and adding tons of creative options. Join Mary Poplin, Boris FX/Imagineer Systems, Product Specialist, at the After Effects Seattle Meet-up Group. She’ll be demoing BCC 10 for Adobe and mocha Pro 5. Learn how the two products will save you massive amounts of time on every day VFX tasks and open up endless creative options. Plus, tons of door prizes including 1 year subscription to Boris Continuum Complete 10 and a 1 year subscription to mocha Pro 5. Join us for a free webinar on Thursday, September 22, 2016. Space is limited. Reserve your webinar seat now. Join Vin Morreale, Boris FX product specialist, as he shows how the highly popular BCC 3D Objects category of Continuum Complete 10 gives editors and VFX artists powerful tools for unlimited titling and 3D motion graphics options - includes a special focus on the new BCC Title Studio, our next gen 3D titling and animation plug-in. 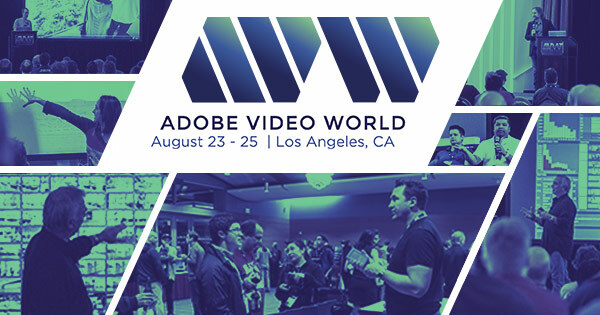 Join us at the 2nd annual Adobe Video World! 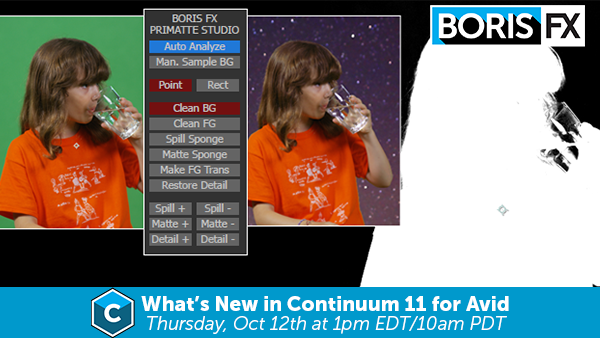 Boris FX/Imagineer Systems Product Specialist Mary Poplin will be demoing Boris Continuum Complete 10 for Adobe After Effects and Premiere Pro, which offers artists and editors the largest, most comprehensive plug-in package on the market. Plus see how BCC and mocha Pro 5 can be used together to add film and broadcast ready effects, motion graphics, titles, and more to your next project. 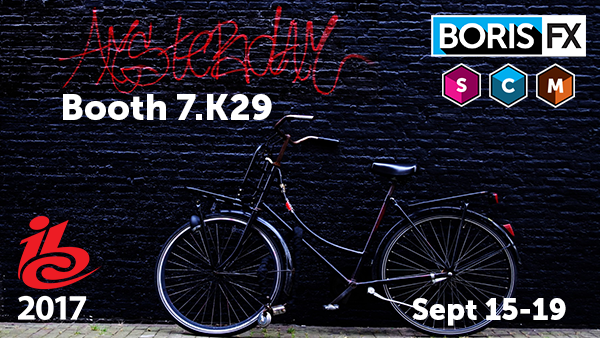 We're jet-setting across the Atlantic once again - heading to IBC in Amsterdam. We're excited to present new time-saving technologies and VFX tools created jointly by the Boris FX & Imagineer teams for the first-time to our European audiences! Swing by booth 7.K29 to find out how we’re making your job even easier – with the mocha Pro 5 and Continuum Complete 10 – and win raffle prizes! Join Mary Poplin, Product Specialist, as she gives a special post-NAB presentation demoing the newest tools co-developed by Boris FX & Imagineer: BCC 10 and the upcoming mocha Pro 5 plug-in that brings high-end visual effects tools to the editor’s timeline. 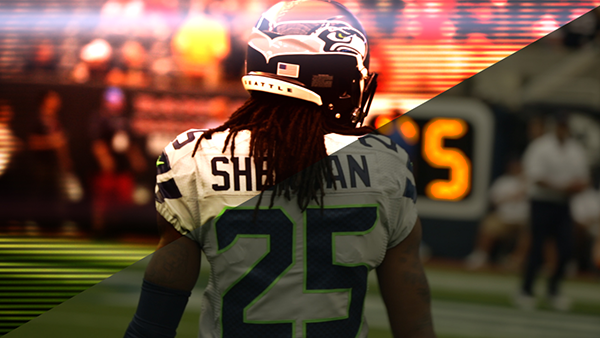 BCC 10 is a major new plug-in release that features integrated mocha masking in every filter. Beauty Studio for digital make-up and skin smoothing, Title Studio for 2D/3D titling, image restoration, new transitions and more. Join us for a free webinar on May 5, 2016. Space is limited. Reserve your webinar seat now. Missed us at NAB? In this special 1 hr live streaming event, we will share our stage demos of BCC 10 (now supporting Adobe, Avid, Resolve & Sony) and premiering the upcoming mocha Pro 5 plug-in. BCC 10 with Product Specialist Vin Morreale New mocha Pro 5 plug-in with Product Specialist Mary Poplin Door Prizes: One lucky attendee will win a BCC 10 Multihost license. What's Happening at NAB We're excited to be launching new products & showing off demos of hot new tech with our friends Imagineer in our booth SL7620 . Swing by for special guest demo artists, daily giveaways & more! Highlights include: New : BCC 10 for new hosts including, Davinci Resolve, Vegas & Nuke Coming Soon : mocha Pro 5 with plug-in option for Adobe, Avid & OFX Technology Demo : Working in 360/VR? Seien Sie dabei beim kostenlosen Webinar am 12. April, 2016! Begrenzte Teilnehmerzahl – reservieren Sie jetzt Boris FX & Gastpräsentator Sven Brencher – Motion Designer und zertifizierter Adobe-Trainer – laden Sie ein zu einem kostenlosen, einstündigen Webinar über neue Plugins für Adobe Creative Cloud. Im Fokus stehen dabei die BCC 10 Plugins für Adobe Premiere Pro und After Effects, die Ihnen umfassende Werkzeuge für Bildrestauration, digitale Kosmetik, Motion Graphics und mehr bieten. Join us for a free webinar on March 31, 2016. Space is limited. Reserve your webinar seat now. Join Boris FX/Imagineer Product Specialist Mary Poplin as she shows Continuum Complete 10 users how to make the most of the new & improved PixelChooser - now powered by Academy Award-winning mocha planar tracking technology. Drastically reduce time-consuming keyframing and masking times without leaving your NLE! Continuum Complete 10 is currently available for Avid and Adobe. Join us in London on March 21st at Jigsaw24 for a night of VFX demos, raffles, food & drink, and more! The night will feature all things Avid. We’ll be showing Continuum Complete 10 for Avid as well as a sneak peek of the new mocha plug-in for Avid before its debut at NAB. Plus, top workflow tips from Avid. Date: Monday 21st March 2016 Time: 17.30 – 21. Join us for a free webinar on February 25, 2016. Space is limited. Reserve your webinar seat now. Join Toolfarm Pluginologist Michele Terpstra as she guides Adobe Premiere Pro + Continuum Complete 10 users through building a reality show style opener from start to finish. Learn how BCC tools help Premiere Pro users do more without leaving their timeline. Register for this free webinar! January 28, 2016 at 11am EST Online Finishing: Look Development & Skin Retouching with BCC 10 Space is limited. Reserve your webinar seat now. Join Boris FX & special guest presenter & finishing artist, Dan Harvey, for a free 1 hour webinar training session on Online Finishing & Effects Techniques. Learn how the new Boris Continuum 10 plug-ins for Avid & Adobe can be used to compliment professional broadcast finishing projects. Register for this free webinar! December 17, 2015 at 1pm EST BCC 10 plug-ins for Adobe Premiere Pro & After Effects Space is limited. Reserve your webinar seat now. Join Boris FX & special guest presenter, Nick Harauz, certified Adobe trainer for a free 1 hour webinar training session on new plug-ins for Adobe Creative Cloud.Learn how the new BCC 10 plug-ins for Adobe Premiere Pro and After Effects add tools for image restoration, digital beauty work, motion graphics and much more. Join us in Paris for the Satis Expo on November 17-19! We will be demoing the newest BCC 10 plug-ins for Avid . Learn how Boris FX and Imagineer Systems are bringing new tools to the editing timeline. Visit us at the Yakyakyak.fr village : Booth #D28 Satis Expo When: November 17-19, 2015 Where: PARIS EXPO, PORTE DE VERSAILLES • HALL 5. Join us for a free webinar on Nov 17, 2015. Space is limited. Reserve your webinar seat now. Boris FX introduces Title Studio , a new 2D/3D titling and motion graphics plug-in found in BCC 10 for Avid . Join industry veteran Kevin McAuliffe in this live, 1 hr training webinar as he shows how editors can design and animate advanced title sequences, lower thirds and credits without leaving the Avid Media Composer timeline. Join us for a free webinar on September 29, 2015. Space is limited. Reserve your webinar seat now. Join Mary Poplin, Boris FX/Imagineer Systems Product Specialist, as she shows you what's coming up in BCC 10 for Avid - available in a few weeks. Learn how BCC 10 will make you work even faster and give you greater creative freedom. BCC 10 will be available on all platforms. We're teaming up with Escape Technology & Framestore to bring you a night of VFX demos, raffles, food, drink & fun! Join the Boris FX and Imagineer Systems team hot off IBC as we showcase new products - Continuum Complete 10 & mocha Pro 5 - which will be available later this fall. Find out how the team is developing new technologies that will make your jobs even easier! It's time to jet set across the Atlantic once again. We’re headed to IBC in Amsterdam. We're excited to present new time-saving technologies and VFX tools created jointly by the Boris FX & Imagineer teams for the first-time to our European audiences! Swing by booth 7.K29 to find out how we’re making your job even easier – with the soon-to-be-released mocha Pro 5 and Continuum Complete 10 – and win raffle prizes! In this event, Nick Harauz, shows how to create a music video from start to finish with Adobe Premiere Pro and Continuum from Boris FX. Join Mary Poplin, Boris FX & Imagineer Systems Product Specialist, at the San Diego Premiere Pro User Group. She'll be demoing how the upcoming Boris Continuum Complete 10 and mocha Pro 5 releases will give Adobe Premiere Pro users awesome new tools to incorporate directly into their workflows without having to leave your timelines! Learn how to easily create VFX and save time. Plus raffle prizes! We’re getting excited for this year’s annual SIGGRAPH ! We’ll be teaming up with our friends at Imagineer Systems to present awesome new time-saving technologies and vfx tools jointly developed for the first-time by the Boris FX and the Imagineer teams. Get sneak peeks at BCC 10 and mocha Pro 5 - available later this year. Swing by booth #312 to find out how we’re making your job even easier. Join us for a free webinar on July 23, 2015. Space is limited. Reserve your webinar seat now. Join online editor and colorist, Tal Y, who is currently working on FOX's summer reality competition hit " Bullseye ," as he guides you through the invisible art of image restoration - VFX that you don't see - using footage from the show. Discover how he relies on Continuum Complete for Avid to get the job done. Join us for a free webinar on June 17, 2015. Space is limited. Reserve your webinar seat now. You asked. We’re delivering. We’ve recently received a lot of requests from editors on how to make better use of the powerful and wide variety of transitions found inside Boris Continuum Complete for Avid Media Composer. Join reality TV and documentary editor, Gray Jones, as he dives into the BCC Transitions category to show you how to work more efficiently and create dynamic, expressive ways to get from shot A to shot B. See Boris FX & mocha Pro in action! Date: June 16-June 19, 2015 Where: Mexico City, World Trade Center Booth: Amtec , Booth A-1 Join Mary Poplin, Imagineer Systems Product Specialist, mocha pro guru, and Boris FX demo artist, at the annual Expo, Cine, Video y Television (Telemundo) 2015 at the Amtec booth. Join Boris FX & Imagineer Systems at the Autodesk® Animation User Group Association in Raleigh, NC. Date : June 11, 2015 Time : 6:30pm Place : The Green Room at Natty Greene's Pub & Brewing Co. Post Production Magic : Time consuming tracking, detailed rotoscoping, high end paint and beauty work, and other post production effects once only done in large studios can now be done on your laptop or home office. We're sponsoring the first annual Bay Area SuperMeet along with our friends over at Imagineer Systems . 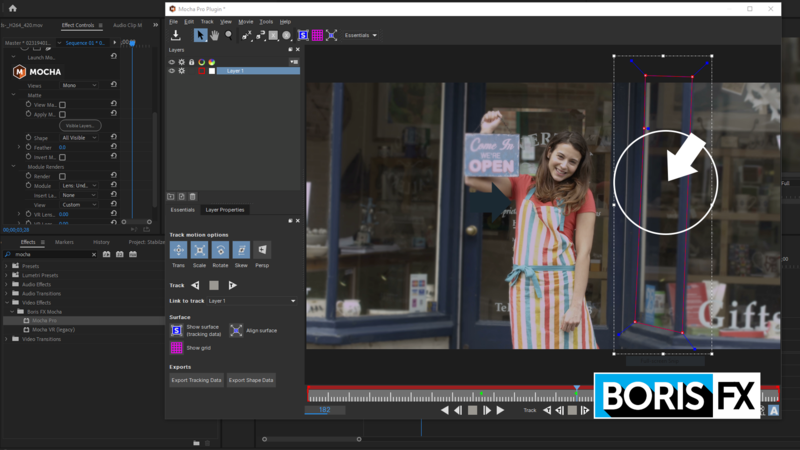 See BCC and mocha Pro in action, plus learn about what's coming up in BCC 10 and mocha Pro 5 . Learn, network, and win tons of raffle prizes including a BCC and mocha Pro license. Produced in cooperation with the FCPX Creative Summit . 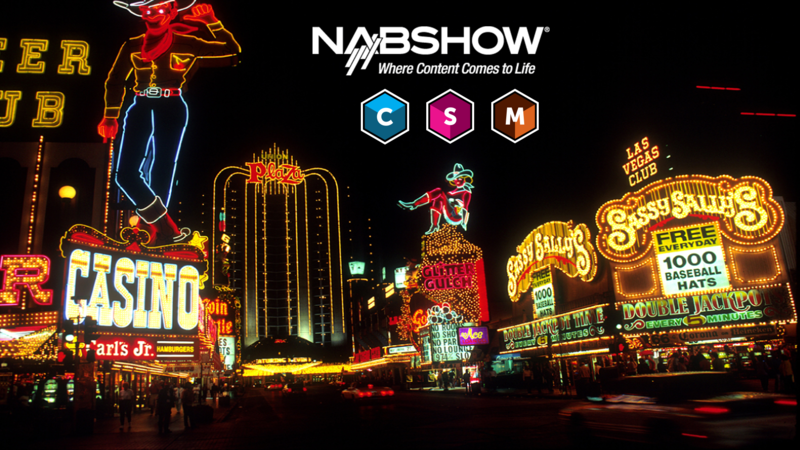 We're getting excited for this year's annual NAB Show (April 13-16) in sunny, warm Las Vegas! We'll be teaming up with our friends at Imagineer Systems to present awesome new time-saving technologies and vfx tools jointly developed for the first-time by the Boris FX and the Imagineer teams. Swing by the booth SL4225 to find out how we're making your job even easier and win raffle prizes! Plus, get into the exhibit hall FREE on us until March 27th with code: LV3963 Register here. 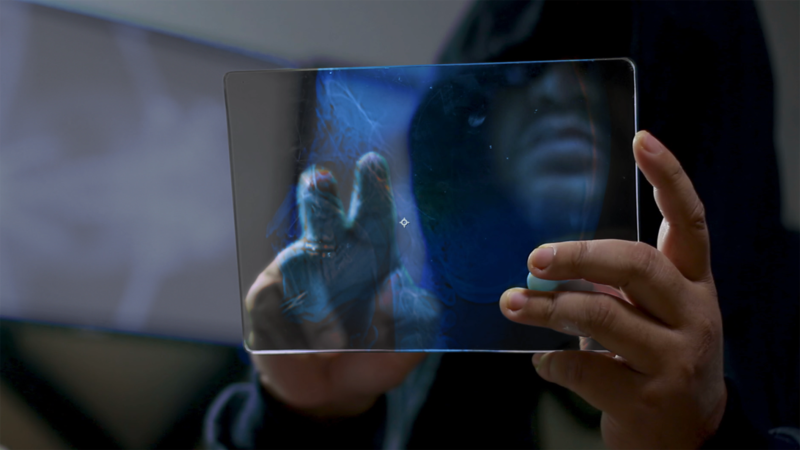 Date : Thursday, March 26th Join Mikey Borup, After Effects certified expert and popular YouTube motion graphics trainer, as he shows After Effects users how to create a slick title sequence inspired by Hitman: Agent 47 (coming this summer) using Boris Continuum Complete. Presented jointly by Boris FX + Imagineer Systems Topics covered: Build a multi-dimensional look with multiple BCC Lights filters Add 3D text and animate Create a custom bokeh background And more. Join us Thursday, March 12th at LAPPG's monthly meet-up. What you'll see : Post Production Magic: Time consuming tracking, detailed rotoscoping, high end paint and beauty work, and other post production effects once only done in large studios can now be done on your laptop or home office. Mary Poplin from Imagineer Systems shows you how to use the same planar tracking techniques used on movies like Casino Royale, Pirates of the Caribbean, and X-Men on any project and any budget. This is a past webinar. View Boris FX webinar replays. Advanced Finishing Techniques Date : Thursday, February 26th Time : 1pm EST/10am PST/6pm GMT In this month’s free webinar, popular Avid trainer Kevin P. McAuliffe will dive into challenging tasks facing every editor. Learn how Boris Continuum Complete (BCC) and mocha Pro from Imagineer Systems can be used together to make quick work of keying, masking, and titles. We left our heart in San Francisco. And we're headed back! Join us on Thursday, January 29th, as trainer Jeff Foster demos all things BCC 9 in Adobe After Effects, plus motion tracking a composite with mocha AE CC from our friends at Imagineer. Learn, eat pizza, and network! Plus, you would win a copy of BCC 9 and mocha plus . This is a past webinar. View Boris FX webinar replays. Blackmagic's DaVinci Resolve 11 added powerful OFX plug-in support to increase editorial and finishing capabilities. In this month's free webinar, noted Resolve trainer and colorist Alexis Van Hurkman will show how Boris Continuum Complete (BCC) and mocha Pro from Imagineer Systems can be used to do complex finishing and visual effects directly within Resolve. Learn how BCC and mocha Pro take your Resolve grading work to the next level of finishing and vfx! This is a past webinar. 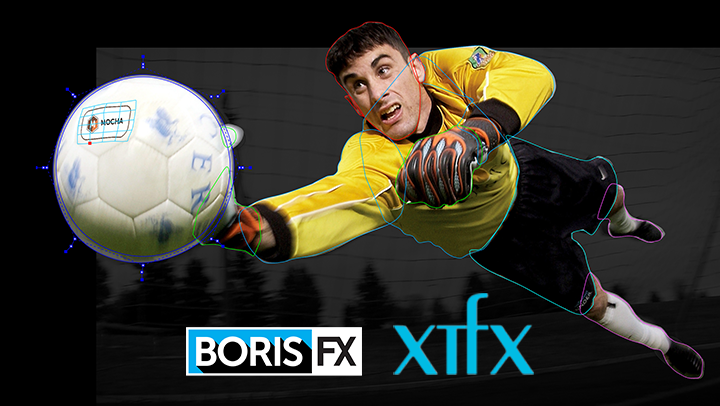 View Boris FX webinar replays. Join us as documentary and reality tv editor Gray Jones uses footage from an adventure travel show "The Unseen Africa" he recently edited to demo Advanced Pan & Zoom techniques with BCC 9 in Avid Media Composer. Here's the trailer: Does this workflow sound familiar? Your client wants you to create a Pan & Zoom effect with a low-res version of a stock image and send them the final effect before they decide whether or not they’ll buy the high-res version. We're excited to be hosting BAVUG (Boston Avid Users Group) in our Fort Point office. Join us for BCC 9 and RED 5.5 (the successor to Avid FX 6) demos, plus food and prizes! Date: October 8th Time: 6:30pm Full registration details here. This is a past webinar. View Boris FX webinar replays. Join Larry Jordan, certified-FCP trainer and the host of the popular Digital Production BuZZ podcast, as he shows FCP X editors the power of the newly released BCC 9 FxPlug for FCP X and Motion 5. Learn how to create 3D extrusions for your next project along with how to save imperfect footage with the new BCC Magic Sharp, the new BCC Lens Correction, and more. Michele Yamazaki from Toolfarm will be demoing BCC 9 AE at our booth. Plus, we're giving away two copies of BCC 9 AE (valued at $995) for the raffle! Catch us in action. Exhibit Hours: Friday, September 26th - 5:30-7:00pm Get more info. This is a past webinar. View Boris FX webinar replays. More and more editors are being tasked with titling, 3D compositing, and graphics creation on top of their day-to-day editing projects. Boris RED 5.5 is here to help. Boris RED is cross-platform – Adobe, Apple, Avid, Grass Valley, Sony, and soon DaVinci Resolve. RED can be accessed directly from your timeline or as a stand-alone engine. Text generators, paint, rotoscoping, extrusions, 3D shapes, and animation tools are all at your fingertips. This is a past webinar. 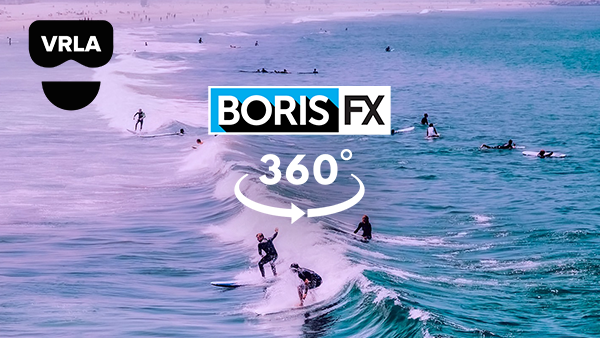 View Boris FX webinar replays. John Rofrano, popular Senior VASST trainer and Sony Vegas Pro editor, is back to bring you a detailed run-down of the top filters and features users will be excited to add to their editing know-how. What you’ll learn: Save time and pull the perfect key with BCC Chromakey Studio. Your one-stop shop for all things green screen. Meet the new transitions for BCC 9, including Film Glow Dissolve, Lens Flare Dissolves, Light Rays Dissolve, and Damaged TV Dissolve Enhance footage by emphasizing specific textural detail with BCC Magic Sharp. We’re blazing across the country for three upcoming user groups to demo BCC 9 in Adobe After Effects, Adobe Premiere Pro, and Avid Media Composer. Come see us! We’re raffling off copies of BCC 9 AE and AVX! Wednesday, June 25th – LACPUG , Los Angeles, CA About the presenter: Gray Jones Gray is a reality/doc TV offiline/finishing editor, compositor, and colorist with over 190 television credits. Dean Velez, motion graphics artist and Adobe-certified trainer, takes After Effects artists through a guided tour of the top new features and filters in BCC 9 AE with greater AE integration than ever before. Highlights include: FX Browser™: Quickly scan all the available presets and save your faves. Image Restoration: BCC Magic Sharp – Bring footage back to its original sharpness. Stylize: BCC Grunge – Add scratches, dust, orbs, flicker, shake, scanlines, bump maps, and erosion. Creating a corporate video, but don’t know where to start? Sure, you could grab a pack of stock templates, but templates get passed around and become overused and instantly recognizable as such. Each project needs to be unique. Brad Swenson breaks down how he used the power of the unlimited options available in BCC 9 AVX with Media Composer to strike the right tone for the breakneck pace of today’s media immersed teens and early 20-somethings. Join Senior Product Manager, Peter McAuley, as he demos the new BCC 9 for After Effects, Premiere Pro, and Avid Media Composer. Date: Tuesday, May 20th Time: 6:30pm Raffle Giveaway: Win a copy of BCC 9 AE or AVX. (valued at $995-$1995) Learn more. This is a past webinar. 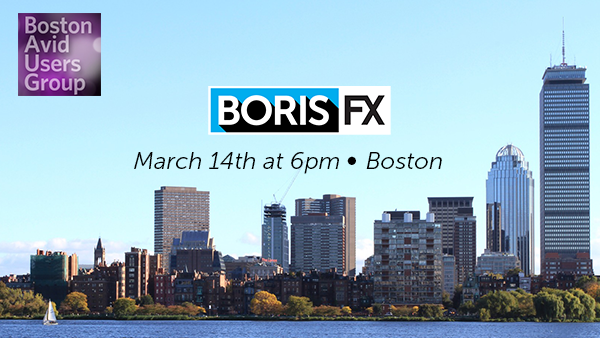 View Boris FX webinar replays. Missed the BCC 9 AVX unveiling at NAB? Get an in-depth look at the new features most useful to Avid editors. FX Browser™ : Find your perfect look faster than ever before. Transitions: 20+ new auto-animating transitions. No more keyframing. Keying and Compositing: BCC ChromaKey Studio Image Restoration: BCC Lens Correction and BCC Magic Sharp Perspective: BCC Pan and Zoom (The editors’ fave goes 3D! We’re unveiling BCC 9 AE and BCC 9 AVX at NAB! See it in action FIRST. Date : 4/7/14-4/10/14 Place : Las Vegas Convention Center, Las Vegas Booth : #SL4228 Registration : Use code LV9287 for a FREE exhibit hall pass Here’s a sneak peek at what you can expect. MediaMotion Ball and International Media Users Group (IMUG) founder, Carey Dissmore gives you an inside look at how he created this year’s animated logo. Armed with BCC 8 AE in Adobe After Effects, you’ll learn how Carey harnessed the power of BCC Extruded EPS, BCC Particle Emitter 3D, BCC Glint, BCC Organic Strands, and BCC Colorize Glow to create the slick, high energy style for the annual NAB event. Perfectly timed with the Olympics, Boris FX brings you Winter Sports Graphics . Jeff Greenberg, Master Instructor for Avid and Lynda.com trainer, guides you down the slopes with BCC 8 AVX in Avid Media Composer. Discover how to add layers of realistic snow to your commercial or bumper, use BCC Type-On-Text to create a 3D automated title, add BCC Film Glow to give your athletes a winning look, and take advantage of BCC UpRez to bring your SD footage to HD quality. Join Peter McAuley, Senior Product Manager, as he demos BCC 8 AE. Date : 12/17/13 Time : 6:30pm Place : Abelcine, 609 Greenwich Street, New York, NY 10014 Click here for full details. Date : Thursday, November 21st, 2013 Time : 1pm EST/10am PST Duration : 1 hour Products : BCC 8 AE & Boris RED in Adobe Premiere Pro Commercial production vet Greg Walton does it all — single-handedly shooting, editing, and finishing spots for his clients. Armed with BCC 8 in Adobe Premiere Pro and Boris RED, Greg quickly and efficiently adds layers of filters to a 30-second spot with 20+ shots. Join Peter McAuley, Senior Product Manager, as he demos BCC AE, BCC AVX, Boris RED /Avid FX, and a preview of the upcoming preset Library Browser! Date : 10/15/13 Time : 6:00pm Place : TekServe, 119 West 23rd Street, NY, NY 10011 Click here for details. Join us for demos with Michelle Yamazaki of Tool Farm and Jason Clement, Boris FX engineer. Think Adobe Premiere Pro was just for editing? Think again. When: August 29, 2013 at 1pm EST Bohus Blahut demonstrates how to create a rich, high energy, 3d multi-layered template with titles exploding out of titles (! ), video mapped to the front of the text, and animation inside virtual cameras – all without leaving Premiere Pro. About Bohus Blahut Bohus Blahut is director of The Vantage Point, a “fiercely independent” production company in Chicago. This is a past event. 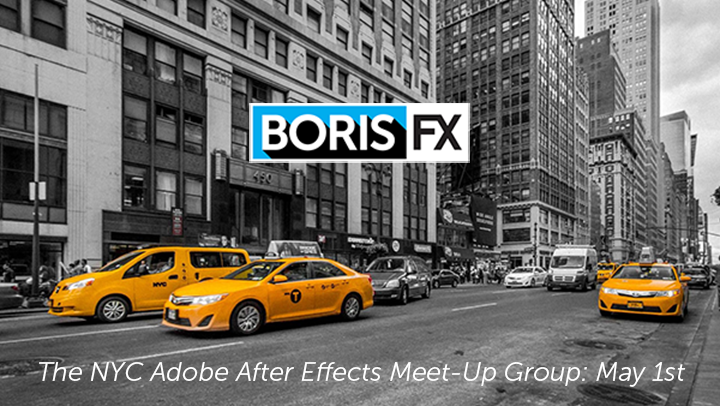 View replays of Boris FX webinars. When: June 27th @1pm EST Toronto-based Avid editor and Creative Cow leader, Kevin P. McAuliffe, demonstrates the finer techniques of Avid FX 6 in Avid Media Composer. In just one hour, you’ll discover how to convert bitmaps to vector (extremely handy when a client gives you a jpeg! ), clone with the paint tool and BCC Optical Stablizer, create write-on effects, and import an EPS file and extrude it into a 3D object that’s also animated in 3D space. Peter McAuley, Senior Product Manager, will be demonstrating the new features of Boris Continuum Complete 8 in Avid Media Composer. (Limited seating available. For more info, email engineer@efxmedia.com ) When Thursday, June 6th, 7:30pm Where NBC, Washington D.C. When: May 23th @ 1pm EST Motion graphic expert John Dickinson demystifies the complex process behind creating action-packed movie trailer graphics using Adobe After Effects and Boris Continuum Complete 8. With the gritty “End of Watch” trailer as your guide, John teaches you how to quickly grab the attention of your potential audience. 14 filters covered including: Extrude Text, Lens Flare, Stage Light, Film Glow, Damaged TV, and many more. When Wednesday, May 22nd beginning at 6:45pm Where Gallery Theatre in Hollywood, CA See Boris Continuum Complete in action and learn more about the latest Boris FX news and updates. When: April 30, 2013 @ 1pm EST Steve Holyhead, owner of Bloomcast, expert Avid user, and master of explaining high concepts in plain-English, presented three BCC effects that you’ll use daily. From generating a Ken Burns-style pan and zoom to making your talent look Hollywood glam with a beauty pass to quickly creating highly stylized transitions, you’ll learn how to efficiently and effectively produce a more professional look, while also discovering some of BCC’s unique features. When: Thursday, February 28, 2013 @ 1:00 PM Eastern Time Attend this free live training event and discover project-saving methods of restoring and touching up images in Adobe After Effects. 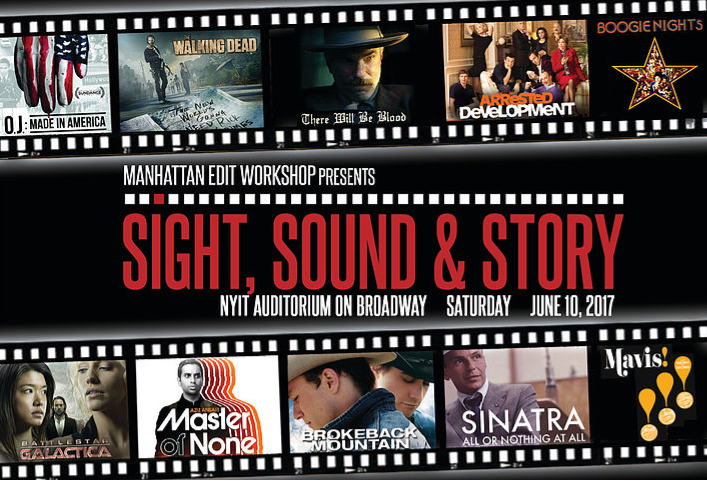 Presented by Michele Yamazaki, author of “Plug-in with After Effects: Third Party Plug-in Mastery”, this live training event will cover the following topics: Saving shots with skin blemishes or substandard makeup Removing moving foreground objects from shots Noise and grain reduction Repairing flicker, damaged pixels, or dust Scaling SD to HD, HD to 2K, or even 2K to 4K while maintaining image integrity About Michele Yamazaki Michele Yamazaki is VP Marketing & Plug-inologist for Toolfarm , a value added reseller and distributor of visual effects software. When: Thursday, January 17, 2013 @ 1:00 PM Eastern Time Join Kevan O’Brien as he delves into the new transitions and filters found in Final Effects Complete 7. With over 120+ designer effects and transitions to choose from, Kevan will show how easy it is to use these filters to create totally unique organic looks with simple adjustments. Version 7 includes nine new auto-animating transitions that integrate within your video editor. When: Thursday, December 20, 2012 @ 2:30 EST Join Avid Certified Instructor Jeff Greenberg as he demonstrates how to fix a variety of common post- production problems using Boris Continuum Complete in Avid Media Composer. Jeff will show you how to: Remove Flicker and Fix Auto-Iris Camera Issues . Repair video affected by a flickering light source or uneven shutter exposure with Boris Continuum Complete’s Flicker Fixer filter. When: Wednesday, December 6, 2012 @ 1:00 PM Eastern Time If you’re new to Boris FX and want to expand your post-production prowess, join Maxim Jago for his live introduction to some of the powerful new features of Boris Continuum Complete 8 as part of an Adobe Premiere Pro CS6 workflow. Learn about integration into your nonlinear editing system, hardware and system performance, and creative and technical effects, and discover new ways to share your vision. When: Wednesday, October 3, 2012 @ 7:00 PM Eastern Time Join cutting-edge motion graphics artist John Dickinson as he taps Boris Continuum Complete v8 AE’s powerful extrusions, particles, and lights to create broadcast graphics. During this live webinar, John will walk through his new HULK animation, which was created exclusively using Boris Continuum Complete filters. John will also discuss Stern FX’s Broadcast Graphics Templates collection which includes 21 high-end motion graphics templates for fast creation of openers and TV graphics. When: Wednesday, June 27, 2012 @ 1pm EST Join Michele Yamazaki as she uses Boris Continuum Complete v8 AE’s state-of-the-art particle system effects to develop and enhance broadcast graphics in Adobe After Effects CS6. Using BCC Particle Emitter 3D and other Boris Continuum Complete VFX filters in conjunction with After Effects’ native 3D camera and lighting systems, Michele will make ordinary graphics and titles pop off the screen in 3D particle bursts. When: Thursday, May 17, 2012 @ 1pm EST Join Steve Holyhead as he demonstrates how to create stunning light effects with Boris Continuum Complete 8 AVX. Learn how to create cinematic looks, stylish broadcast design elements, and beautiful transitions with BCC Lens Flare 3D; simulate production lights, projectors, or stage lighting with BCC Stage Light; create the soft feel of exposed film with BCC Film Glow; and generate eye-catching title effects with glints and rays. 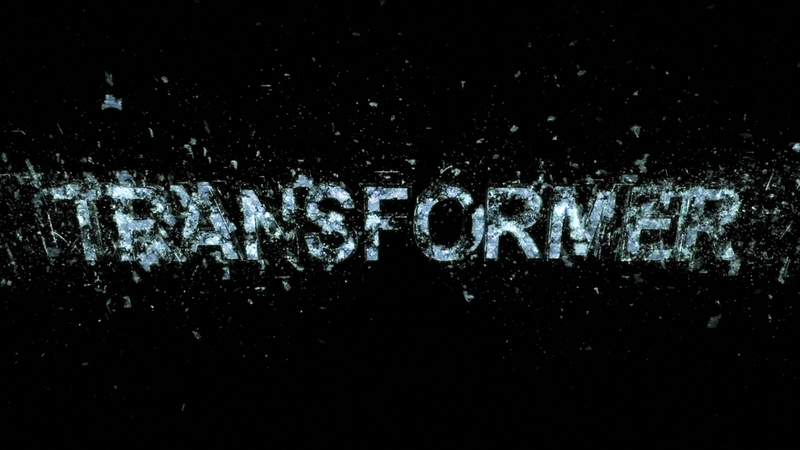 When: Thursday, March 22, 2012 @ 1pm EST Join Michele Yamazaki as she teaches you how to create the following effects… FOX’s Fringe 3D Text Effect J. J. Abrams’ science fiction television series Fringe revitalized the old-school technique of incorporating 3D text in video. Now, numerous shows are creating their own spin on this same concept. Learn how you can easily create this unique 3D text effect combining Boris Continuum Complete with Adobe After Effects’ 3D cameras and lights. When: Thursday, March 1, 2012 @1pm EST Join John Rofrano as he demonstrates how to create professional titles and VFX in Sony Vegas Pro 11 using Boris Continuum Complete 8 and Boris RED 5. Attend this free live webinar and learn how to: Create the soft feel of exposed film with BCC Film Glow Repair video affected by flickering light or uneven shutter exposure Create stylish broadcast design elements and beautiful transitions with BCC Lens Flare 3D Create cool 3D title animations Generate audio-driven effects such as a pulsing light or an image wipe that follows the beat of an audio track About John Rofrano John Rofrano is the author of several books and DVDs on Sony Vegas Pro and ACID. When: Thursday, January 26, 2012 @ 1pm EST Join Philip Hinkle of Frogman Productions as he demonstrates how to create professional titles and VFX in Grass Valley EDIUS 6 using Boris RED 5. The live webinar will cover the following topics: Chroma key compositing with Matte Choke and Light Wrap 3-way color correction Film look effects Lower-third titles with text styles Title animation and extrusion Importing and manipulating subtitles About Philip Hinkle Philip runs Madison, Wis-area video production company Frogman Productions. When: Thursday, December 15, 2011 @1pm EST Join Adobe Premiere Pro expert Tim Kolb as he demonstrates how to create killer transitions in Adobe Premiere Pro using Boris RED 5 and Boris Continuum Complete 8 AE. Attend this free live webinar and learn how to: Apply Boris RED as a two-channel transitional effect in Adobe Premiere Pro Review transitional effects in the Boris RED Library Browser Customize preset effects to match your footage and project Effectively use Lens Flare, Lens Blur, and Damaged TV as transitions Use Boris Continuum Complete 8 AE filters as transitions in Adobe Premiere Pro About Tim Kolb Tim Kolb of Kolb Productions is a Emmy, Chicago Film Festival Hugo, and Telly Award-winning director and a 20 year veteran of video and television production. When: Wednesday, November 9, 2011 @ 1pm EST Join VFX expert Steve Holyhead as he demonstrates how Boris workflow and VFX tools can streamline your workflow when working with video editing applications from Adobe, Avid, and Apple. Attend this free live webinar and learn how to: Use Boris Soundbite to quickly and accurately find any word or phrase spoken in recorded media Seamlessly transfer Apple Final Cut Pro or Avid projects to Adobe After Effects for finishing Exchange projects between Apple Final Cut Pro and Avid editing and finishing systems Easily work with Boris Continuum Complete effects across video editing applications and platforms About Steve Holyhead Steve’s education began with 16mm film, and he transitioned to videotape when he started his career in television. When: Thursday, November 17, 2011 @ 1pm EST Join Jeff Greenberg as he demonstrates how to create professional VFX in Avid Media Composer 6 using new Boris Continuum Complete 8 AVX tools such as Videoscope, Film Glow, Beat Reactor, and Flicker Remover. Attend this free live webinar and learn how to: Create the soft feel of exposed film with BCC Film Glow Repair video affected by flickering light or uneven shutter exposure Ensure broadcast-legal colors of your final output or any individual element in your project Generate audio-driven effects such as a pulsing light or an image wipe that follows the beat of an audio track About Jeff Greenberg To the great annoyance of his parents, Jeff left a pre-med program to pursue a degree in film. When: Thursday, October 20, 2011 @ 1pm EST Join Kevin P. McAuliffe as he introduces Boris Continuum Complete 8, the world’s most comprehensive VFX plug-in suite. 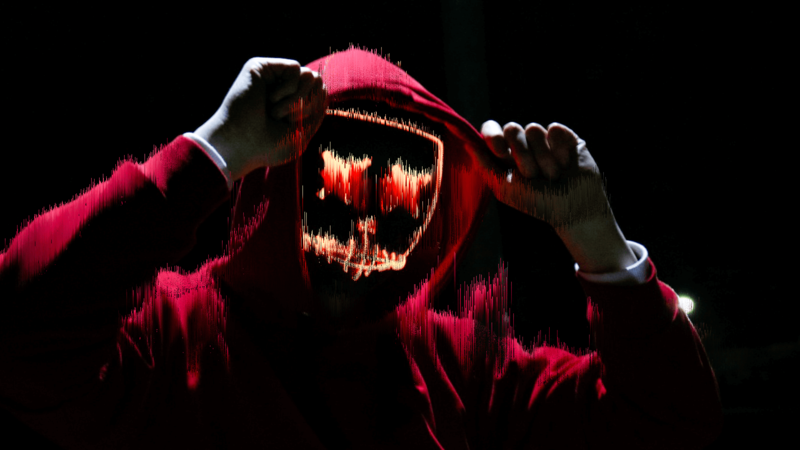 200+ filters include 3D Objects such as Extruded Text, 3D particle effects, image restoration tools, lens flares, keys and mattes, 3 Way Color Grading and other color correction tools, time-based effects such as Optical Stabilizer, warp and perspective effects, and blurs, glows, and cinematic effects. When: Thursday, August 11, 2011 @ 1pm EST Join Floh Peters as he demonstrates 4K workflow, native RED Digital Cinema camera support, cool title animations, and 3-way color grading with Media 100 Suite v2 and Boris RED v5. About Floh Peters Floh Peters is a post-production workflow specialist, VFX artist, digital media specialist, and instructor with 17 years of post-production experience. As the Technical Director and Editor of his company, Magic Eye Videoproduktion, he has worked on several award-winning TV shows for the largest German TV stations. When: Thursday, July 21, 2011 @ 1pm EST Join Vik Narayan as he demonstrates how to create Hollywood-style effects with Boris RED 5. Learn how to paint with clone brushes over images, vector-trace and extrude images, and animate on custom paths. About Vik Narayan Vik Narayan has over 17 years of experience as a director, editor, compositor, and mograph artist working on everything from TV commercials to long form documentaries. When: Thursday, June 23, 2011 @ 1pm EST Join Jeff Greenberg as he shows you how to create professional composites and titles in Avid Media Composer using Boris RED 5. Jeff’s presentation will cover: Boris RED’s Text Tool and Style Palette Lower Thirds, Type on Text, and Text on a Path EPS Import and Extrusion Color Correcting with Custom Masks Chroma Key Composites with Custom Spline Mattes and Filtering About Jeff Greenberg To great annoyance from his parents, Jeff left a pre-med program to pursue a degree in film. When: Thursday, May 19, 2011 @ 1pm EST Join John Rofrano as he demonstrates how to create custom effects and titles with Boris RED 5 in Sony Vegas Pro 10. Boris RED is the only integrated 3D compositing, titling, and effects application to deliver unparalleled performance to video editing software from Adobe, Apple, Avid, Grass Valley, Media 100, and Sony. An indispensable tool for post-production and broadcast professionals, RED offers a wide range of features right on your NLE timeline and adds a standalone engine for effects creation and rendering. When: Wednesday, April 6, 2011 @ 1pm EST Media 100 Suite v2 will introduce support for RED Camera workflows including 4K and 2K video formats, REDCODE media, and the RED ROCKET hardware for accelerated rendering. Other new features will include a revamped Motion Editor for Pan and Scan and DVE effects, improved media search capabilities, and a streamlined, modeless ColorFX window for fast access to all ColorFX options. When: Wednesday, January 26, 2011 @ 1pm EST Join Future Media Concepts Instructor Jeff Greenberg as he shows you how to make your footage look its best with Avid Media Composer and Boris Continuum Complete 7 AVX. 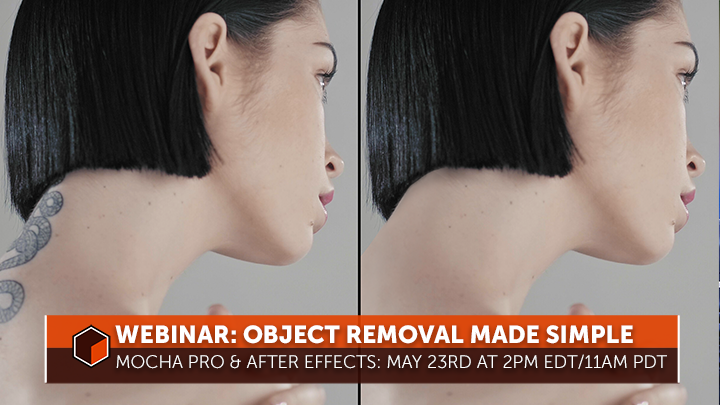 Attend the Webinar and learn how to: Revive SD clips for HD projects Solve camera or lens defects Remove HD noise and compression artifacts Create a convincing “Day For Night” effect Add in-camera effects such as Rack Defocus and Motion Blur Perform selective color correction Emulate the distortion effect of shooting with a super wide angle lens Smooth blemishes while maintaining detail contrast and highlight integrity About Jeff Greenberg Teaching internationally for Future Media Concepts, Jeff specializes in post production. When: Thursday, December 16, 2010 @ 1pm EST Join Emmy, Hugo, and Telly Award-winning director Tim Kolb as he demonstrates the comprehensive VFX power of Boris Continuum Complete 7 AE in Adobe Premiere Pro. Webinar attendees will experience: Simulated in-camera effects such as BCC Lens Blur and BCC Motion Blur Image retouching techniques with BCC Smooth Tone Matching Grain in composites Recreating Film Process on footage Designing sophisticated transitions with BCC Lens Blur and BCC Swish Pan Presenter Tim Kolb of Kolb Productions is a Emmy, Chicago Film Festival Hugo, and Telly Award-winning director and a 20 year veteran of video and television production. When: Tuesday, November 16, 2010 @ 1pm EST Explore the Boris Calligraphy titling plug-ins that are included with Apple Final Cut Pro. Then, learn how to take your titles to the next level using Boris Continuum Complete 7 FxPlug’s 3D Objects filters. Webinar attendees will experience: Boris Calligraphy’s styles, style palette, multiple strokes, and professional typography Creating a credit roll and generating random text with Boris Calligraphy Applying Boris Continuum Complete’s rays and glows filters to text BCC Extruded Text with professional typography, materials, bevels, and deformers Importing and extruding EPS files with BCC Extruded EPS BCC Extruded Type-On Text to complement Apple Motion’s type-on text Presenter Larry Jordan is a producer, director, editor, consultant and Apple-Certified trainer with over 25 years video production and post-production experience. When: Wednesday, November 3, 2010 @ 1pm EST Turn Sony Vegas Pro 10 into an effects and compositing powerhouse with Boris Continuum Complete 7! Attend this webinar and learn how to: Create precise, realistic keys with a minimal amount of adjustment Achieve the warm organic look of film in seconds Selectively apply BCC filters to video via region or channel-based mattes Use BCC’s built-in motion tracker to track an image and apply an effect to the tracked image Featured Boris Continuum Complete 7 effects will include BCC Chroma Key, BCC Matte Choker, BCC Light Wrap, BCC Witness Protection, BCC Wire Remover, and BCC Correct Selected Color. When: Tuesday, August 31, 2010 @ 1pm EST This webinar will show Avid editors why they don’t need to leave the comfort of Media Composer for all their effects and titling work. The webinar will include demonstrations of the following: Transferring FCP sequences to Media Composer with Boris AAF Transfer Creating jaw-dropping titles inside Media Composer Creating film looks with Boris Continuum Complete 7 AVX Creating realistic-looking chroma keys “Witness protection” effect with automated motion tracking Making SD footage shine in HD with BCC UpRez Simulating camera lens effects with BCC 7 AVX’s new Lens Blur filter Presenter Kevin P.
When: Wednesday, July 28th at 1:00pm Eastern Time More and more motion graphics designers are using Adobe After Effects to build compositions which define a clear visual 3D space in which to create compelling animated graphics. In the Boris Continuum Complete 7 AE filter package, Boris FX provides several extremely useful generator-style filters for creating sophisticated 3D graphic elements that integrate tightly into After Effects 3D comps.